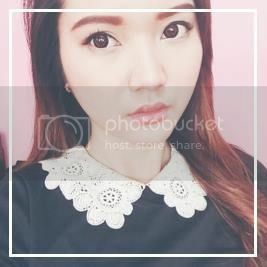 I have seen Beauty drinks from Cheesie's blog (all time fave blogger) and she keeps on raving about these products as if it she needed it in her life. /haha I wonder why I haven't seen one available here in the Philippines. I'm curious! I was surprised last Saturday when my cousin handed me 6pcs of these "unfamiliar" bottles and curiously asked me if it's perfume. 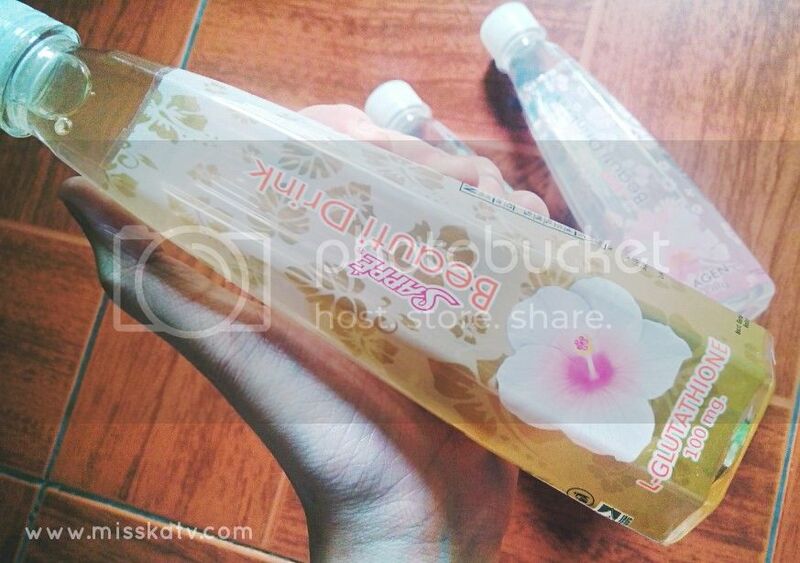 Honestly, I thought it was some kind of body wash. /really! Then I looked at the packaging label and realized it was actually a drink! I did some research just to make sure if it's safe or how and when should I drink it. 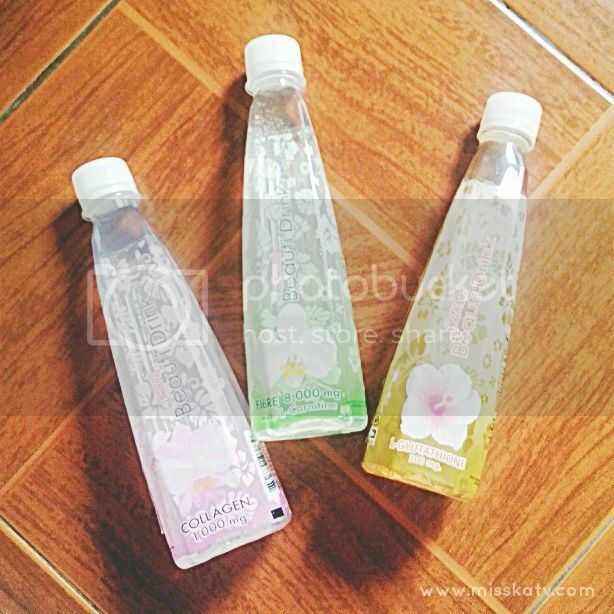 I found out that it is a very POPULAR bottled drink in THAILAND. 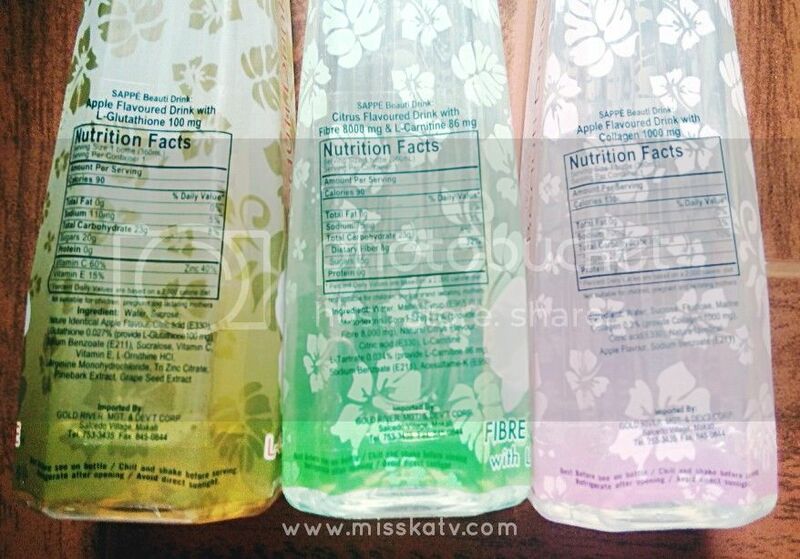 It's not just a bottled drink! It is something that quenches your thirst while leaving your skin glowing while promoting good digestion at the same time! 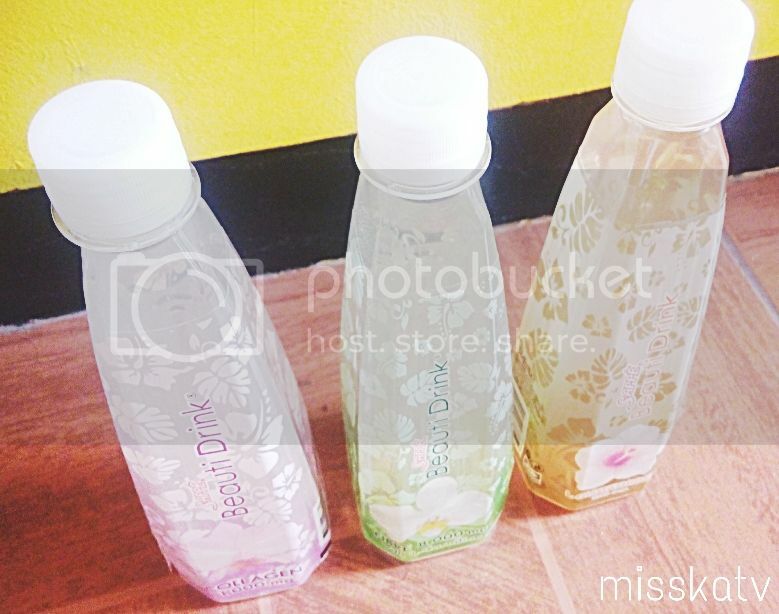 Beauti drink comes in 3 variants. COLLAGEN, FIBRE & L-GLUTATHIONE. 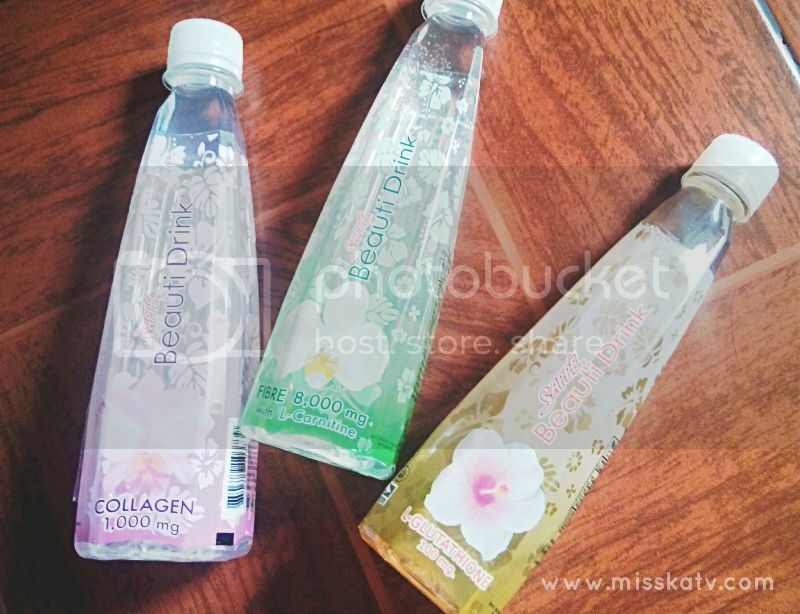 Of course the first one I want to talk about is the most interesting COLLAGEN drink! 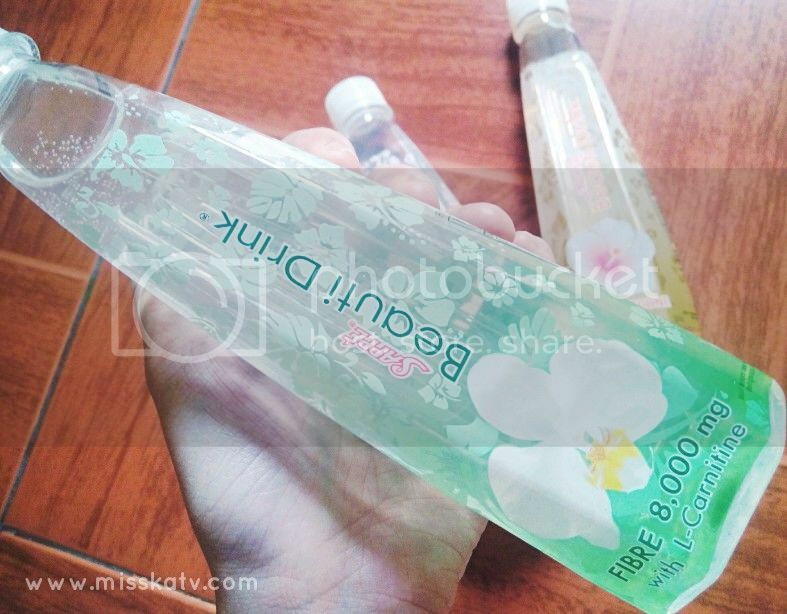 It is an apple-flavored drink which contains 1000mg of Collagen that helps moisturize the skin and prevents dryness. It helps in tightening hair follicle, prevents OSTEOPOROSIS, alleviate shrinkage, maintain skin elasticity and effectively increase skin moisture. Normally our body can productively generate COLLAGEN by itself until we age around 20, and then the production rate gradually declines and causes the skin to loose its moisture. In order to maintain the skin moisture and avoid skin shrinkage and wrinkles, it becomes necessary to substitute the self-generated COLLAGEN by the intake of extracted COLLAGEN, generally from CHICKEN SKIN, COW TENDON or FISH SCALE. However, the source of high quality and highly effective COLLAGEN should be from DEEP SEA FISH. Next is FIBRE 8,000mg drink that has L-CARNITINE which helps burn fat. It has a slightly citrus taste. it is for anyone who wants to maintain good figure and weight, including those who lack vegetable intake. /ouch A bottle is equivalent to 2 big POMELOS or 8 small TANGERINES. this helps the digestive system to work efficiently. Plus no SUGAR added! 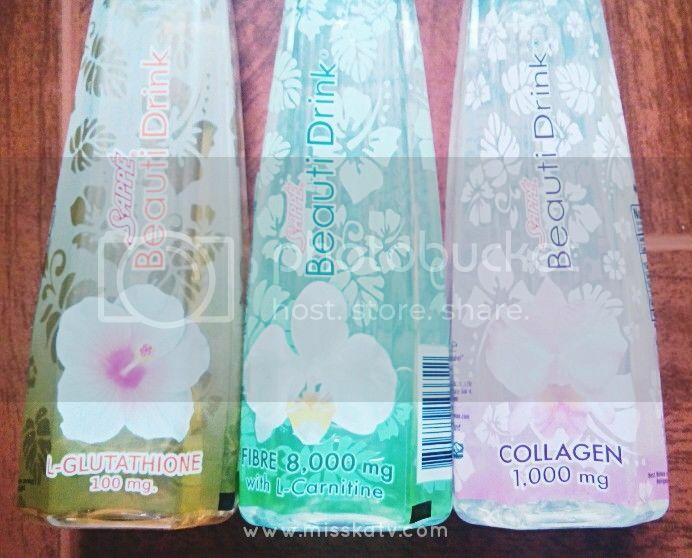 Lastly, this beauti drink which cotains 100g of L-GLUTATHIONE that helps whiten skin naturally, reverse dark skin pigments and protect skin from UV RAYS. It contains grape seed extract that prevent skin from losing elasticity ans increase skin smoothness. 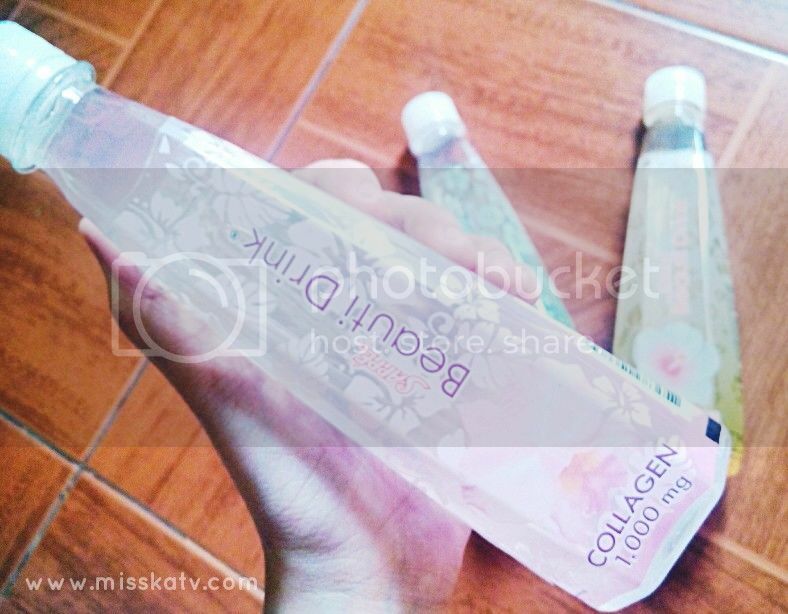 These drink are available at any MERCURY DRUGSTORE, WATSONS & 7 ELEVEN outlets! NOW ONTO THE GIVEAWAY WINNER~!